For two years the deep space mining vessel Atromitos has been adrift and the crew are presumed dead. Now the genetically modified human crew of the Teleios is sent out to explore the stranded ship and bring its precious cargo back to save Earth. Once the crew start to explore the Atromitos they come across the sole human survivor in Travis O'Neill (played by Weetus Cren), unfortunately he is uncooperative and unable to help the Teleios crew explain the missing crew or the whereabouts of the cargo. The crew search for answers but ultimately end up hitting a brick wall and the tension between the crew is not helping them get any closer. It soon becomes apparent that O'Neill knows more then he is letting on and as the genetically modified human crew start to show unusual traits towards each other, O'Neill reveals where the cargo is and why it so important not to take it back to Earth. As O'Neill's robot Lulu becomes violent and the crew start to kill each other off it comes down to O'Neill, the sole human and Iris Duncan (Sunny Mabrey) the last remaining genetically modified human. Will humanity survive or will ultimately science triumph? 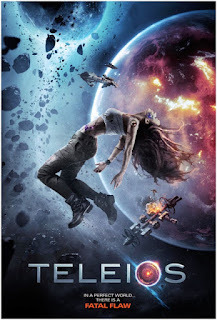 'TELEIOS' is a wonderful sci-fi which looks like it has been influenced heavily by 'STAR TREK' and the use of space imagery throughout helps keep you involved with the characters which are also well written. The standout performance has to be Sunny Mabrey as the stunning but sophisticated Iris Duncan whos characters quest for answers really pushes the film in to a whole new realm of its own. Ian Truitner has written and directed a film that is stunning to watch and will give viewers a film that will keep them thinking throughout.